Photograph courtesy John Powell. 25084 heads eastwards at Llandulas viaduct on December 14th 1982 with the 11.57 Bangor - Manchester Victoria. The twenty year career of D5234/25084 saw allocations to all regions apart from the Southern. December 1963 to Nottingham (16D). April 1964 to Saltley (2E). March 1968 to Nottingham Division (D16). May 1968 to London Midland (Midland) Lines LMML. 25084 was the 207th Class 25 withdrawn, one of six retired during December 1983. After withdrawal 25084 was stored at Carlisle Kingmoor until June 1984, it then moved to Newton Heath until February 19th 1985 when 25084/86, 25270 were moved from to Swindon Works for scrapping. 25084 was scrapped during the first week of July 1986. On February 19th 1985 25084/86, 25270 were moved from Newton Heath to Swindon Works for scrapping. 25084 was scrapped during the first week of July 1986. Photograph courtesy Roger Geach. 25084 & 25086 at Newton Heath depot on December 7th 1984. Noted Crewe Works March 1971. Noted Derby Works May & June 1975. Noted Glasgow Works October - December 1979 (Intermediate repair - Paint Date November 24th 1979). D5233 - D5237 were constructed at Derby during the last quarter of 1963, all being released to traffic during December to Toton (16A). 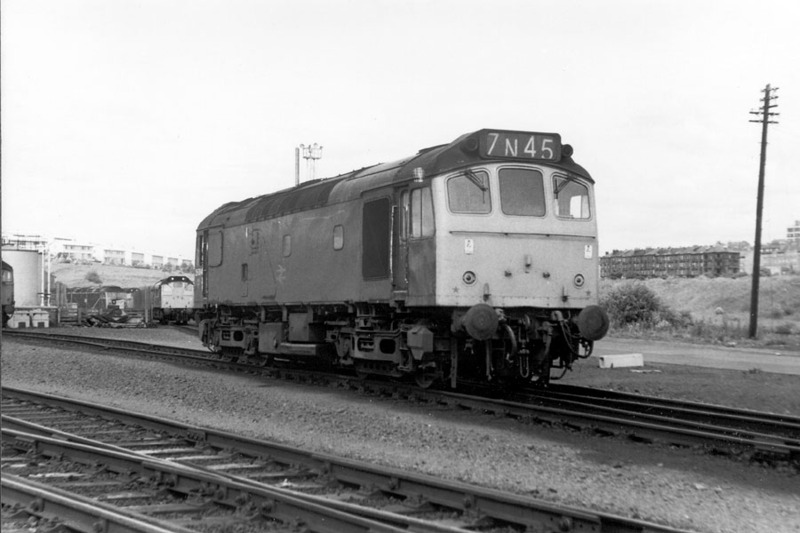 This batch of locomotives were the first to be delivered featuring the re-styled body work and two tone green livery similar to that carried by the Brush Type 4s (class 47s). The redesign principally affected two areas; the cab and the location of the air intakes. The gangway doors fitted to the earlier examples were rarely used, their presence certainly added to the complaints of noise and draughts in the cabs. The removal of the air filters to the cantrail was the result of a comparison carried out at Inverness between a batch of Derby built Type 2s and a batch of BRCW Type 2s, the tests targeting the air quality within the engine room. The tests revealed the location of the grilles on the Derby designed build allowed for much more debris to reach the filters (especially the lower ones), clogging them quicker, leading to decreased air quality within the engine compartment, and so potentially affecting performance and engine wear. With over two hundred Class 25s still on the order books the redesign of these areas would result in a cost savings in the long run, in addition to a better working environment within the cabs, and providing less cluttered look to the locomotive's exterior. 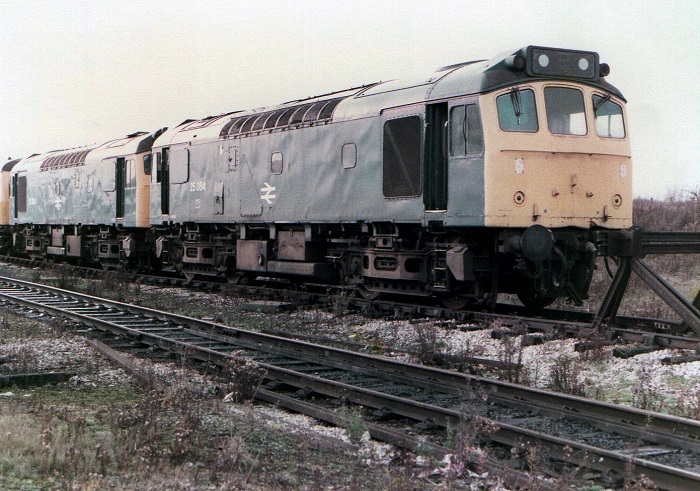 One unique feature of these machines was their being equipped with steam heating equipment, all the following Class 25s would be without boilers. D5234 & D5235 were sent out on their test runs to Corby on December 4th 1963. D5234's stay at Toton was brief, during December it moved to Nottingham (16D). D5234 moved to Saltley (2E) during April. 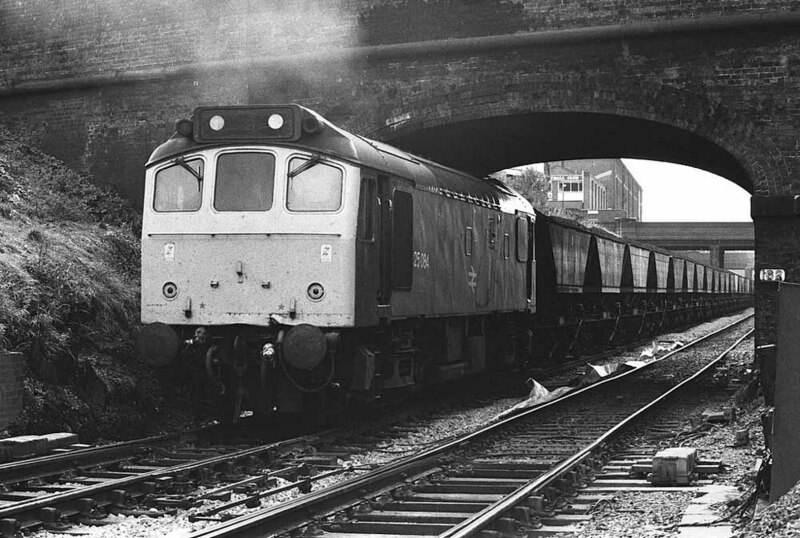 At this time much of the freight on the Derby - Birmingham line was still steam hauled, these transfers would allow for further driver training on the new diesels over this route and also the Birmingham - Leicester line. On May 16th D5234 hauled the 08.06 Newcastle - Birmingham. After two years at Saltley D5234 was reallocated to the Midland Lines (ML) during April. During the summer months Derby Works received D5234 for repair. Crewe commenced receiving Class 25's for heavy repairs during January, with 5234 and 7669 being new arrivals. Class 25's overhauled & repainted at Crewe were usually easily recognised by the position of the number, similar to that of Glasgow it was situated behind the cab door on the bodyside, though usually placed higher up than one shopped by Glasgow. On July 10th the roundtrip Nottingham - Llandudno service was workled by 7564 and 5234, both locomotives were in two-tone green. December 18th found 5234 on front line duty hauling the 1N31 Poole - Newcastle, noted 25 minutes late at Darlington. On January 13th 5186 & 5237 and 5641 & 5234 were noted working Leicester - Finsbury Park (for Highbury) F A cup tie specials. After almost ten years allocated to London Midland depots 5234 moved to Haymarket, then to Eastfield during September. The stay here was brief, by October 5234 had moved to Tinsley. Although 5233 - 5237 were oddities in terms of their bodystyling & being boiler equipped, this technical difference did not affect the issuing of TOPS numbers for them, they were numbered in order with the remainder of the Class. During March 25084 was allocated to Cardiff. 25084 was noted in Derby Works for repair during May & June. After release from Derby Works its return to the Cardiff area was brief, during July it transferred to Haymarket. Photograph collection of webmaster. 25084 at Eastfield, date unknown. It did not visit Glasgow Works until December 1979 and was only transferred to Haymarket in the summer of 1975, so with a still working headcode indicator this must be shortly after its arrive on the Scottish Region. On January 14th 25084 came to the rescue of 86251 working the 1M37 12.35 Edinburgh - Manchester. 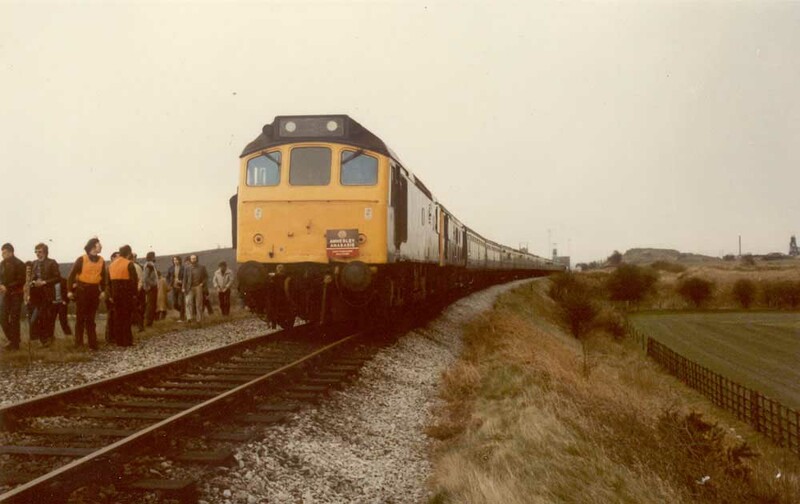 The Class 86 stalled near mp70, the Class 25 pushing the train into Abington loop, where fitters were able to revive the electric enough for it to continue south. On April 8th (Good Friday) the 1S51 07.18 York - Aberdeen began its journey behind 40059, being replaced at Edinburgh by 25044 & 25084. December 29th found 25084 coming to the rescue of a Class 47 on the 08.45 Aberdeen - Kings Cross after its partial failure at Stonehaven. The Type 2 was removed at Dundee as it was vacuum braked only, limiting speed to 50 mph. 25084 was noted receiving an Intermediate repair at Glasgow Works between October & December, the Paint Date on the cab front was November 24th 1979. On January 23rd 25084 was noted northbound through Inverkeithing with a short rake of empty ballast hoppers, probably bound for the quarry at Clatchard Craig near Newburgh. 25084 was noted at Aberdeen on September 20th. 25084 was noted at Perth on September 26th with a Dundee - Glasgow passenger. After five years on the Scottish Region 25084 received its last transfer, to Carlisle Kingmoor during October. Engineering work at the south end of the WCML led to diesel substitutions, on March 1st 25085 covered one brief working between Stonebridge Park and Euston whilst the 20.45 Barrow - Euston was worked forward from Bletchley by 25084 on 3rd and 25085 on 8th. 25084 was the Manchester Victoria pilot on March 28th. On April 12th 25084 was stabld at Tinsley. April 25th found 81017 on fire at Canley Halt working a 07.56 Coventry � York special. 25084 arrived from Coventry to propel the train to Birmingham International where 86237 took over. The 18.15 Birmingham - Norwich on February 17th was diagrammed for 25084, by Washwood Heath the Class 25 was losing power, 31216 was added here for the run to Leicester. About lunchtime on April 16th 25042 & 25084 were noted passing Leamington Spa with loaded ballast hoppers, half of the wagons were reversed into Avenue sidings, the remainder headed south, the locomotives returned light northbound during the early afternoon. On April 24th 25058 & 25084 took over a Norwich � Weston Super Mare excursion from Birmingham New Street. By May 2nd 25084, now attached to 25221 worked out and back from Wolverhampton to Aberystwyth, with a charter that had originated at Euston. Photograph courtesy Andy Hoare. 25084 at St Andrews Junction lends its weight banking a Didcot bound MGR during 1982. One can but imagine just how the engine exhaust sounded as it bounced off the underside of the overbridge. 25084 took over the 02.10 Manchester Piccadilly - Cleethorpes at Sheffield on June 17th, returning with the 08.26 to Doncaster. 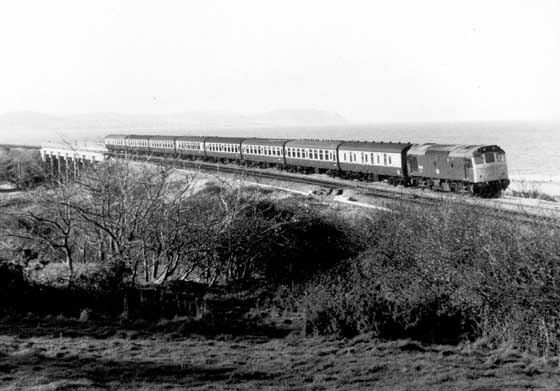 Four days later it traversed the Settle - Carlisle route with the 16.05 Leeds - Carlisle. On June 24th 25084 worked the 11.05 Glasgow Central - Carlisle via Kilmarnock. It was recorded north of the border again during the latter part of July working Glasgow - Carlisle services on 19th & 23rd. 25084 was also working the GSW route in September handling a round trip each day on 9th, 15th & 17th. By October 1st it had migrated to the 16.05 Leeds - Carlisle. It was a round trip over the Settle & Carlisle for 25084 on November 23rd working the 08.57 Leeds - Carlisle and 15.37 return. Four days later it was time for a thrash along the North Wales coast with 25084 working the 07.45 Manchester Victoria - Bangor. On March 20th 25084 was stabled at Warrington Arpley. On March 28th 25084 was noted at Skelton Junction with a mixed freight from the Warrington direction. The Annesley Annabis railtour on April 2nd utilised 25048 & 25084 between Bescot and Annesley colliery. Photograph collection of webmaster. Somewhere in deepest, darkest Nottinghamshire, well Bulwell actually, 25084 & 25048 with the above mentioned railtour pause for the obligatory photographic stop, April 2nd 1983. On May 9th 25084 handled the 16.02 Leeds - Carlisle. On May 30th 25084 was stabled at Skipton station. 25084 was noted passing Copy Pit with an eastbound ballast working on a wet June 11th. 25084 had been active in Scotland during July, being noted on passenger workings between Carlisle & Glasgow on 15th, 18th, 19th & 22nd, completing almost seven hundred miles of passenger mileage. 40085 & 25084 worked the Widnes - Hope cement empties on August 12th. September 18th found Severn Tunnel Junction depot using two Class 25s on local workings, 25199 on the morning local to Hereford and 25084 to Gloucester. Two days later 25084 was busy between Blackpool & Manchester Victoria working three services. These may have been the last passenger services hauled by 25084. 25084 was noted passing Greenfield light engine on November 23rd. 25084 was withdrawn on December 18th 1983. No.1 cab valencing: damage to valencing above driver's side buffer: March 1981 until withdrawn.